BIN-IT has 10- to 40-yard residential and construction bins in the Northumberland County, Ontario area. With these bins and other equipment, we can safely remove a tree from your yard, clear your new lot, demolish an entire building, clear your trails and bush-hog your field once or throughout the season. BIN-IT has a reputation for reliable, meticulous work. We work with a smile, we start early and we clean up when we leave. Have renovation rubbish? Spring cleaning clutter? Landscaping litter? BIN-IT has bins for residential and commercial uses. Do-it-yourself or use our full-service labour. Every job is customized, fast and simple for you. BIN-IT will mow your property for an annual clean-up, or regularly bush-hog throughout the season. Our bush hog can handle 2.5” trees, brush and rough weeds. 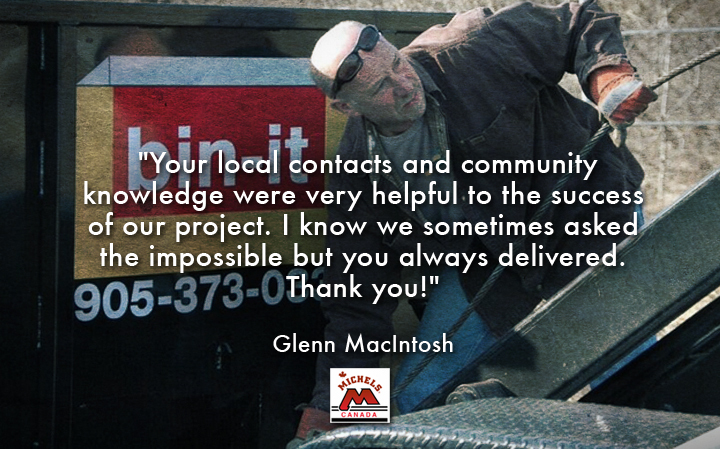 Let us tidy your trails, clear your property or clean out your ditches. Our bush hogging service has been used to clear between one and several acres of land. Wish you could access all parts of your densely treed or wet property? BIN-IT has trucks, tractors, trailers, a bush hog, a roto-tiller, and an off-road, 10” chipper at your disposal. And we have unsurpassed service and labour. BIN-IT has cleared many kilometres of off-road trails through dense forest, along hillsides and in wet areas. 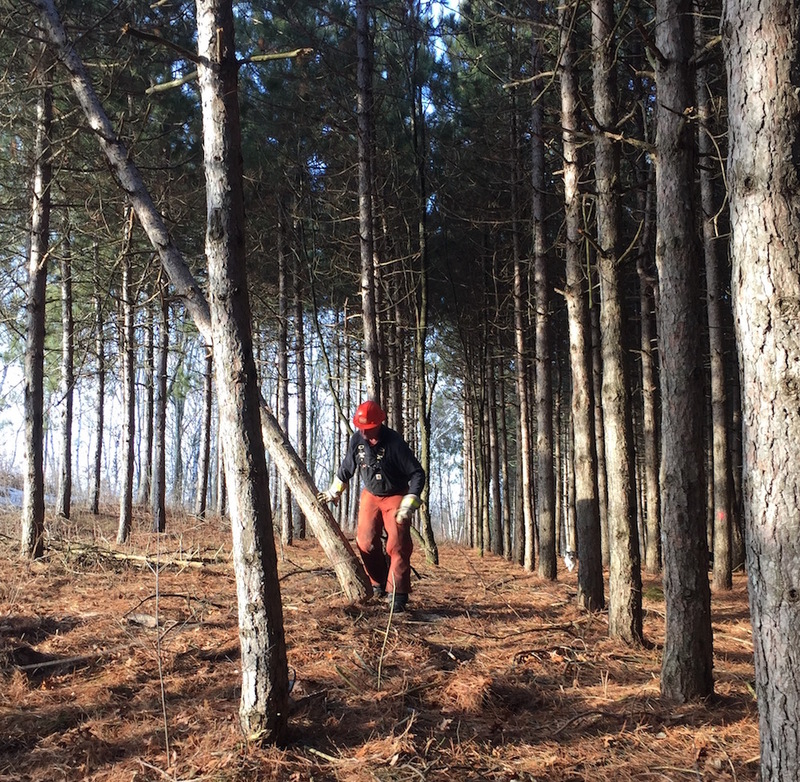 We have experience constructing perimeter trails to access land, even the parts you haven’t seen before. We have helped many clients clear away fallen or damaged trees after storms. We’ve removed trees from gardens, cars and roofs, carefully and quickly. We’ll go where other tree removal services won’t and create a new frontier in your own backyard. Find out what it means when we say "it's cleared!" We have the equipment & we work quickly. From overgrown to clear, we'll get your lot or acreage ready for development. BIN-IT's CAT 299 Wide Track Skid Steer clears property. We make space for dream homes, build amazing trails through woods, and basically create ground zero for future land development plans. Our equipment includes a 72" rotary head for extreme bush-hogging (rough grass, terrain and trees up to 3" in diameter), a forestry head for fast land clearing (trees up to 12" diameter), a 20,000 pound winch and a mulcher that will not only remove trees, but grind up the fallen trees and branches, along with rough shrubs, and leave your land ready for planting. Like what you see? Click for more! We're experienced and we can provide both tools and labour. With excavators, bins, tractors and labour, we’ll demolish anything from a house to a barn, from a garden shed to a commercial building; and when we leave, we'll take the mess with us. BIN-IT offers a one-stop shop to demolish and remove almost anything, and we’ll leave your site clear and clean when we leave. Our experience includes fire-damaged houses, 100-year-old barns and garages. BIN-IT is MOE Licensed, which means we can legally remove waste. BIN-IT is fully insured to take on your project. Not too much stands in our way. Click to see how we do it. BIN-IT is MOE Licensed & Fully insured. We serve Brighton, Campbellford, Cobourg, Colborne, Port Hope and areas in between. Also Belleville, Oshawa and Peterborough.